Prof. Isik Ozguven is a Turkish citizen, who studied and obtained her Ph.D. in Turkey and since 1992 has served as Professor in the Horticulture Department at Cukurova University in Adana, Turkey. Prof. Ozguven has participated in many international meetings and received a series of scholarships from governments and universities. She convened and led the First International Symposium on Pomegranates and Minor Mediterranean fruits held in Adana, Turkey in October 2006. Prof. Ozguven specializes in horticulture with special emphasis on pomegranates, strawberries, plums and hazelnuts. Her major interest is related to growth regulators of horticultural plants. Mr. Baruch Bar-Tel is a citizen of Israel who studied and obtained his Ms.C. in plant breeding, genetics and phytopathology from the Agricultural University at Wageningen, Holland. Mr. Bar-Tel is an active expert of UPOV, the international organization which promotes and approves new varieties and breeders' rights (an organization parallel to the WIPO which deals with patents). Mr. Bar-Tel is affiliated with the Scientific Service of the Agricultural Research Organization, The Volcani Center, at Bet-Dagan. He conducts variety testing for registration of Plant Breeders’ Rights in Israel, Europe, Latin and Central America, South Africa and other countries, as well as for the U.S. Plant Patents and Trademark Office. Dr. Dan Rymon is from Israel. He obtained his Ph.D. from The Horticultural University of Budapest, Hungary. Dr. Rymon specializes in agricultural economics with emphasis on marketing and works in many countries. He served 25 years as an economist and marketing specialist at the Israeli Agricultural Research Organization (Volcani Center). 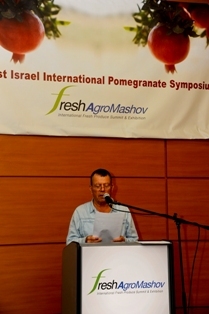 For the last 6 years Dr. Rymon has been the CEO of Pomeg-Tech, the Israeli global consulting firm which covers all facets of the pomegranate industry. Pomeg-Tech cooperated in the organization of this Symposium. Dr. Doron Holland is an Israeli scientist who obtained his Ph.D. in Israel from the Weizmann Institute of Science, Rehovot, Israel. Dr. Holland is at present a Senior scientist, heading the Fruit Tree Sciences unit at the Newe Ya'ar research center. The center belongs to the Agricultural Research Organization of the Ministry of Agriculture and Rural Development in Israel. Dr. Holland's main research interests are Molecular Genetics of Deciduous Fruit Trees, Control of Dormancy, Breeding of Almonds, Apricots and Pomegranates and Regulation of Color Production (anthocyanin) in Pomegranates. Dr. Fathi Abd El-Hadi is an Israeli, whose education (B.Sc., M.Sc. and Ph.D.) is from the Hebrew University of Jerusalem's Faculty of Agriculture. Dr. Abd El-Hadi specializes in horticulture with emphasis on pomegranates, almonds and olives. He acquired important international experience in all of these crops in many countries. He served for many years in the Agricultural Extension Service of Israel's Ministry of Agriculture and Rural Development as chief extension officer for the crops just mentioned. Since its inception, Dr. Abd El-Hadi has served as the Chief Agronomy Officer of Pomeg-Tech, the Israeli consulting firm that offers global coverage of all facets of the pomegranate industry. 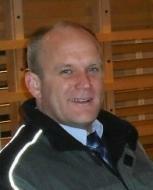 He is responsible for all the agronomical consulting of the firm in many countries. Dr. Gary Ward, a citizen of Israel, who obtained his Ph.D. from the Hebrew University of Jerusalem’s Faculty of Agriculture in 2002. His research was conducted under the supervision of Prof. Yitzhak Hadar and Prof. Carlos Dosoretz. After a brief postdoctoral position at the Technion, he joined StePac in May 2004 as a part of their global technical support team, working together with customers to ensure that they obtain maximum benefit from the company’s wide range of modified atmosphere packaging products and complementary postharvest solutions. He also taught Bioremediation and Fermentation technology course at Tel Hai Academic College. Since 2006, he serves as StePac’s CTO which, among other responsibilities, involves leading an innovative R&D program which will lend to further growth of the company in years to come. Dr. Joshua Miron is an Israeli, who obtained his Ph.D. from the Hebrew University of Jerusalem's Faculty of Agriculture. Dr. Miron is an active scientist and director of the Department of Ruminant Sciences, in the Institute of Animal Science of the Agricultural Research Organization, Bet Dagan, in Israel. Dr. Miron's scientific interests are in ruminant nutrition, development and evaluation of new forage crops, feeding under heat load conditions, chemistry and metabolism of forages and their by-products, and rumen microbiology. Dr. Mohammad Ghous is a horticultural expert from Afghanistan. He serves as a fruit tree expert and manages the Perennial Horticulture Development Project under the auspices of the European Union in Kandahar, Afghanistan. They promote the pomegranate industry successfully and their most significant achievement is having convinced the farmers to replace their poppy crops with pomegranate orchards. To our regret Dr. Ghous underwent an accident a few weeks ago and will not share with us personally his presentation on the pomegranate industry in Afghanistan; he sent us the presentation and wishes us to present it in his absence. 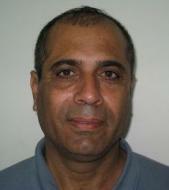 Mr. Yochanan (Yohi) Lev is an Israeli who obtained his M.Sc. from the Technion, Israel Institute of Technology, Haifa. 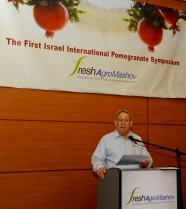 Mr. Lev is a farmer who owns a farm in which he grows a variety of fruits, among them he is especially proud of a relatively large pomegranate plantation. A special activity of Mr. Lev relates to the development of managerial software adapted to managing pomegranate plantations.